My favorite thing about April in Bombay is Alphonso mangoes at every corner. And with mangoes comes mango Lassi, a yogurt drink which brings out the best in the fruit’s flavor but also refreshes like nothing else on a hot, humid day in the Maximum City. But since I’ve been stuck in NYC this Spring, and anyway, the time for my beloved juicy, rich and creamy mangoes would be done with anyway, in comes my favorite store — Trader Joe’s — to the rescue. 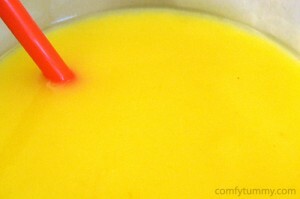 Their newest item: a fantastically nutritious and delicious Alphonso Mango Lassi in a bottle, ready-made! Not just any mango, made with the king Alphonsos themselves! At just $ 2.69 for a quart, and with only 130 calories per serving, this is one indulgence I don’t plan on doing without this summer. Try it as a refreshing drink on ice, or have it with muesli in the morning, as a super delicious alternative to milk! N-joy! This entry was posted on Saturday, June 18th, 2011 at 2:11 pm and is filed under Food, Tasting the World in NYC.